Chief Justice Gilbertson was elected to a 4-year term as Chief Justice by the members of the Supreme Court in September 2001, was re-elected to a second 4-year term as Chief Justice by the members of the Supreme Court in June 2005, a third 4-year term in June 2009, a fourth 4-year term in June 2013 and a fifth 4-year term in 2017. He was appointed to the Supreme Court in April 1995 to represent the Fifth Supreme Court District, which includes Brown, Butte, Campbell, Clark, Codington, Corson, Day, Deuel, Dewey, Edmunds, Faulk, Grant, Hamlin, Harding, Marshall, McPherson, Perkins, Potter, Roberts, Spink, Walworth and Ziebach counties, and was retained by the voters in the 1998, 2006 and 2014 general elections. 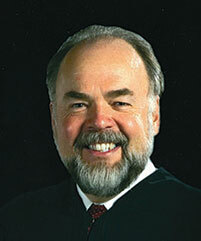 Chief Justice Gilbertson received his undergraduate degree from South Dakota State University in 1972 and his Juris Doctor from the University of South Dakota, School of Law in 1975. He engaged in private practice from 1975 until his appointment to the circuit court bench in 1986. He served as a Circuit Judge for the Fifth Judicial Circuit from 1986 until his appointment to the Supreme Court in 1995. He served as President of the Conference of Chief Justices for the 2015-2016 Term. He has previously held the positions of Board Member, First-Vice President and President-elect and has chaired various committees. He also served as Chairman of the Board of Directors for the National Center for State Courts for its 2015-2016 Term. From 2010 to 2016 he served as the state court representative of the Criminal Rules Committee of the United States Courts. In 2006 he was the recipient of the Distinguished Service Award from the National Center for State Courts for his defense of judicial independence. He was the recipient of the “Grass Roots” Award by the American Bar Association in 2014 also for his defense of judicial independence. He is the past President of the South Dakota Judges Association. He also serves on the Judicial-Bar Liaison Committee of the State Bar Association and has served as a Court Counselor at South Dakota Boys State since 1995. Chief Justice Gilbertson and his wife Deb, have four children. Justice Kern, who was appointed to the Supreme Court on November 25, 2014, by Governor Dennis Daugaard, represents the First Supreme Court District, which includes Custer, Lawrence, Meade and Pennington counties. She received a Bachelor of Science degree in 1982 from Arizona State University and her Doctor degree from the University of Minnesota Law School in 1985. Justice Kern worked in the Attorney General’s office from 1985–1996 serving in a variety of capacities including the appellate division, drug prosecution unit and as Director of the Litigation Division. She was appointed a Circuit Court Judge in 1996 in the Seventh Judicial Circuit comprised of Custer, Fall River, Oglala Lakota and Pennington Counties and served 18 years on the trial court bench. She is a member of the American Law Institute, the National Council of Juvenile and Family Court Judges, the State Bar Association, the Pennington County Bar Association, the American Bar Association Fellows and past President of the South Dakota Judges Association. She served on the Council of Juvenile Services from 2004–2013 and on the Federal Advisory Committee on Juvenile Justice from 2004–2008 and on numerous other boards and commissions. Justice Kern and her husband Greg Biegler make their home in the beautiful Black Hills. Justice Jensen was appointed to the Supreme Court by Governor Dennis Daugaard. He was sworn in on November 3, 2017. Justice Jensen represents the Fourth Supreme Court District consisting of Union, Clay, Yankton, Hutchinson, Hanson, Davison, Bon Homme, Douglas, Aurora, Charles Mix, Gregory, McCook, Turner and Lincoln Counties. Justice Jensen grew up on a farm near Wakonda, South Dakota. He received his undergraduate degree from Bethel University in St. Paul, Minnesota in 1985 and his Juris Doctor from the University of South Dakota School of Law in 1988. He clerked for Justice Richard W. Sabers on the South Dakota Supreme Court before entering private practice in 1989 with the Crary Huff Law Firm in Sioux City, Iowa and Dakota Dunes, South Dakota. In 2003, Justice Jensen was appointed as a First Judicial Circuit Judge by former Governor Mike Rounds. 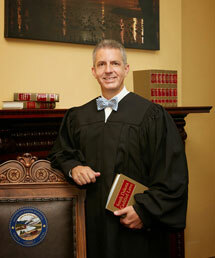 He became the Presiding Judge of the First Judicial Circuit in 2011. Justice Jensen served as chair of the Unified Judicial System’s Presiding Judges Council, president of the SD Judges Association, and has served on other boards and commissions. In 2009, Justice Jensen was appointed as a Judicial Fellow to the Advanced Science and Technology Adjudication Resource Center in Washington D.C. Justice Jensen and his wife, Sue, have three children. 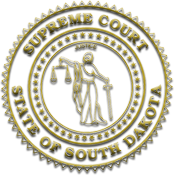 Justice Salter began as a member of the Supreme Court on July 9, 2018, following his appointment by Governor Dennis Daugaard. 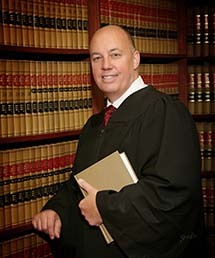 Justice Salter received a Bachelor of Science degree from South Dakota State University in 1990 and his Juris Doctor degree from the University of South Dakota School of Law in 1993. After clerking for a Minnesota state district court, he served on active duty in the United States Navy until 1997 and later served in the United States Naval Reserve. Justice Salter practiced law with the Sioux Falls firm of Cutler & Donahoe, where he became a partner before leaving in 2004 to return to public service with the United States Attorney’s Office for the District of South Dakota. 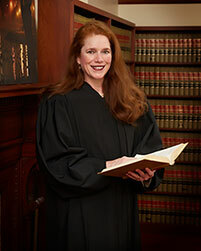 As an Assistant United States Attorney, Justice Salter focused on appellate practice and became the chief of the office’s Appellate Division in 2009. He was appointed as a Circuit Court Judge by Governor Daugaard and served in the Second Judicial Circuit from 2013 until his appointment to the Supreme Court in 2018. Justice Salter served as the presiding judge of the Minnehaha County Veterans Treatment Court from its inception in 2016 until 2018. He also serves as an adjunct professor at the University of South Dakota School of Law where he has taught Advanced Criminal Procedure and continues to teach Advanced Appellate Advocacy. 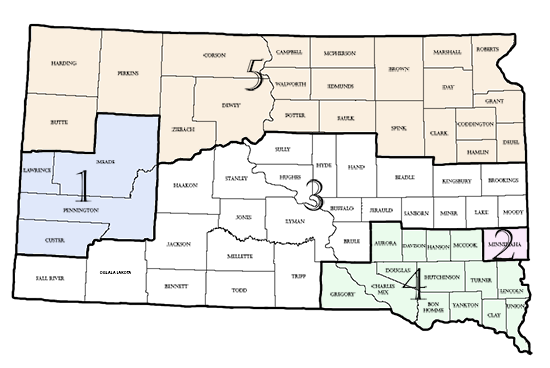 Justice Salter represents the Second Supreme Court District which includes Minnehaha County. He and his wife, Sue, have four children.